On April 20th, H.E. 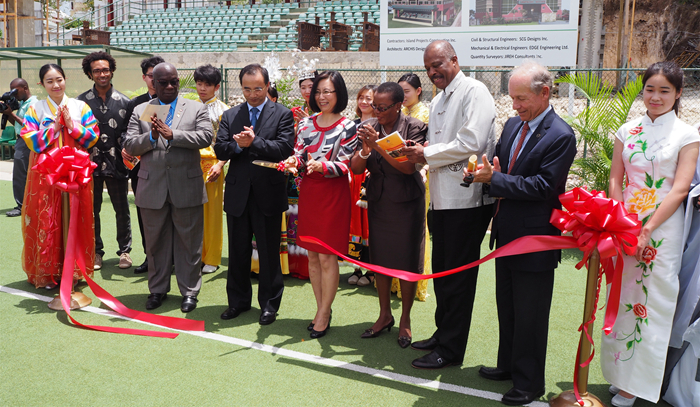 Ms. Wang Ke, Chinese Ambassador to Barbados, attended the Ribbon Cutting Ceremony for the launch of the Confucius Institute at the University of the West Indies Cave Hill Campus, which is co-established by the China University of Political Science and Law. Hon. Ronald Jones, Minister of Education, Senator Hon. Maxine McClean, Minister of Foreign Affairs, Sir Hilary Beckles, Pro-Vice-Chancellor and Principal of the UWI Cave Hill Campus, and Professor Huang Jin, President of the CUPL attended the ceremony. Ms. Xu Lin, Chief Executive of Confucius Institute Headquarters sent a letter of congratulations to the Campus. In her congratulatory letter, Ms. Xu believed that the Confucius Institute at the Cave Hill Campus would infuse new energy to the Campus’ grand vision of cultivating talents with a global vision and would actively contribute to the promotion of educational exchanges and cooperation between China and Barbados, as well as to the development of the diverse cultures of the world. 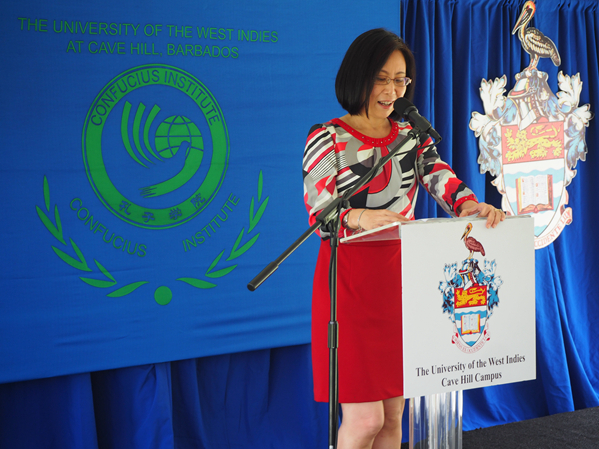 Ambassador Wang expressed in her remarks that the Confucius Institute at the Cave Hill Campus would fulfill the Barbadian’s growing desire of learning the Chinese language and understanding Chinese culture. She anticipated that UWI and CUPL could make concerted efforts to build the Confucius Institute into an influential and distinctive platform in Barbados and the Caribbean to teach Chinese language, introduce China, facilitate cultural exchanges, and promote the China-Barbados and China-Caribbean friendly cooperation. Hon. 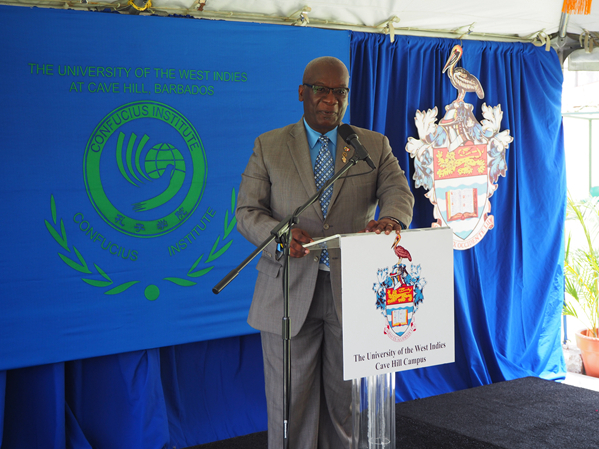 Minister Jones stressed in his remarks that since the establishment of the diplomatic relations, the practical cooperation between Barbados and China have achieved fruitful results, while the friendship between the two peoples has kept deepening. The Confucius Institute at the UWI Cave Hill Campus provided a great platform for the Barbadians to study the Chinese language and understand Chinese culture. He encouraged the Barbadian youths to take this opportunity to learn the Chinese language and contribute to the further development of the friendship and collaboration between the two countries. 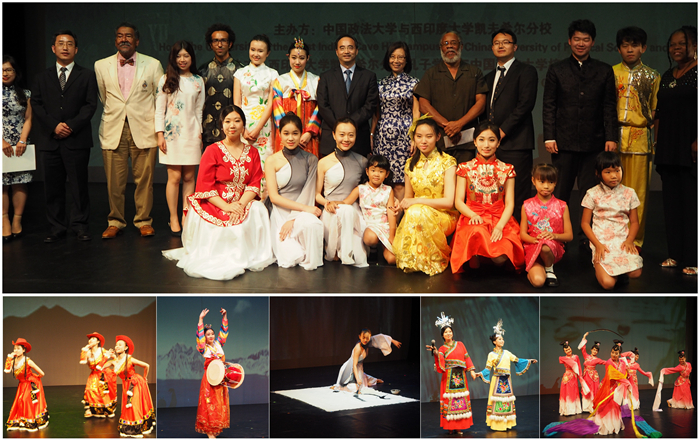 On the day, the UWI Cave Hill Campus and the CUPL jointly held an Evening Gala in celebration of the launch of the Confucius Institute at the Errol Barrow Centre for Creative Imagination. The Students Art Troupe from the CUPL gave a fantastic performance to the teachers and students of the Campus, and the local friends from various sectors.